There is a lot of hype this week about Marvel's first new Star Wars comic book series since it stopped publishing a monthly serial in 1987 that is debuting on January 14th, but with a little less fanfare Comixology recently began selling digital editions of previous stories from a long time ago in a galaxy far far away. Dark Horse Comics which published Star Wars titles from 1991 - 2014 and lost its license for the franchise this year is having their work redistributed now through Marvel. The Dark Horse Star Wars titles have now been re-branded "Marvel" logo and a "Legends" banner which differentiates these non-canon titles versus the brand new comic books from Marvel debuting this year which are considered part of the official extended Star Wars story under Disney's new franchise management plan. 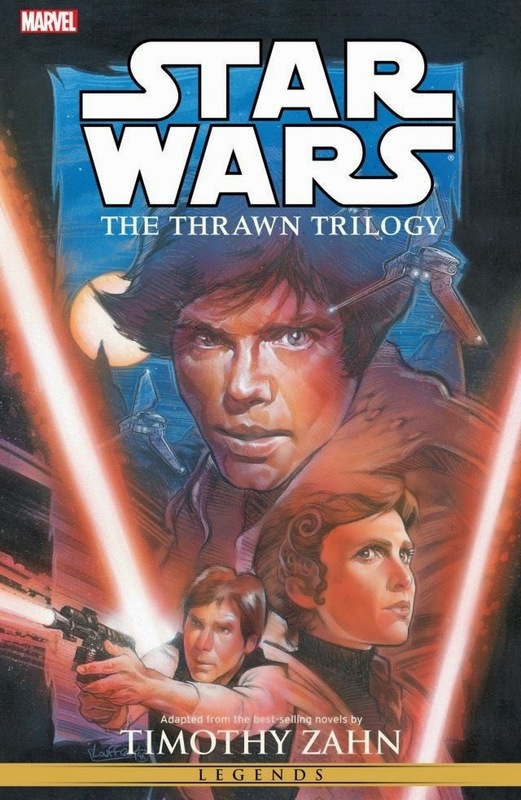 Now consumers can purchase the original Marvel Star Wars comic book series (1977-1987), the Dark Horse publications, and the new original series Marvel is now creating in digital format from the Comixology website. Previously the older publications had been available through Dark Horse's own online marketplace www.digital.darkhorse.com. People who have purchased Star Wars comic books in a digital format from Dark Horse in the past can still access those titles through their website or mobile apps but can't purchase any additional Star Wars publications from them since their license ended at the end of the year. If you bought Star Wars digital comic books from Dark Horse in their end of the year fire sale right before they lost the license in December 2014, don't despair because you can still access them (I flipped through a few of mine online today with no problem) and you still got a good deal. I purchased "Han Solo at Stars End" for .99 cents from Dark Horse in December and it is now being sold for $4.99 on Comixology and I purchased "Star Wars: A Long Time Ago Volume 3" for $4.99 and it is now being sold for $19.99. Since I tend to read my digital comic books on my iPhone and iPad, I actually prefer the Dark Horse app because it provides a better ios user experience than Comixology does since it was bought by Amazon.com and limited its interface with Apple devices to support its new parent company's Kindle devices. If you didn't pick up the Dark Horse titles last year though, they haven't vanished and are still being published just by a different company through a different website. Marvel also has a good relationship with having its new titles available digitally through Comixology so you now will be able to pick out the new stories featuring the Star Wars universe as they come out along with the Avengers, Captain America, Guardians of the Galaxy, Spiderman, the X-man and other superhero titles available via the site.